The Texas Stars got their first look at the Manitoba Moose on Wednesday night in a 5-4 loss. 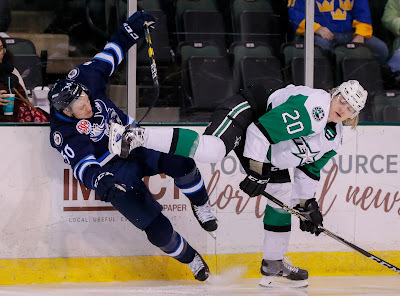 Balanced scoring was a bright spot for the Stars as Roope Hintz, Joel L’Esperance, James Phelan, and Colton Hargrove all scored a goal, but a poor second period in which they allowed three at even strength was their undoing. In his first postgame interview as the newly-minted Stars captain, veteran center Justin Dowling was quick to shoulder blame with his line registering a minus four in scoring differential. The opening frame saw the Stars get off to a rough start when Moose winger Seth Griffith crashed the net to dislodge a loose puck from beneath Landon Bow six and a half minutes into the contest. It was a bad goal for Bow to allow considering he had position and was waiting for the whistle that never came. The Stars responded by outshooting the Moose the rest of the period and getting the tying goal on their second power play chance. Hintz’s goal came on a deflection from Dowling giving Hintz his ninth point in eight games. Not to be overlooked was the impressive offensive zone keep by L’Esperance as he batted the puck down out of the air on a clearing attempt. If he let it go, it surely would’ve resulted in the Moose going back to even strength. L’Esperance put another stamp on the game less than two minutes into the second period when he netted his seventh goal of the year. He finished short side high on Eric Comrie after a nifty drop pass from Adam Mascherin. Moose forward Logan Shaw had been hunting a goal since he caught the post in the first period after a putrid Stars turnover. Eventually the scoring came in spades for 2011 Florida Panthers draft pick. He cashed in on one nearly halfway through the game to tie the score at two after he streaked across the blue paint and scooted his first goal past Bow. It was the first instance of a tough stretch of play by Bow in which he allowed three goals in the frame on only a handful of shots. The Stars countered Shaw’s first goal on the very next shift as the fourth line got on their horse and rushed the offensive zone, setting up Phelan for his point blank marker. The momentum was short-lived, however. Less than two minutes later, the Moose won an offensive zone draw and Kristian Vesalainen roofed one cleanly past Bow to knot the game up again. Shaw nabbed his second point of the game with his primary helper. Topping off his three point night, Shaw then one timed a sweet feed from behind the net via JC Lipon, giving him his second goal four minutes later. The Stars had the building buzzing for the final two minutes with their net empty once again and occupied the offensive zone for a few golden chances. Comrie had just enough in the tank to eke out the win. The Stars will be back at it against the Rockford IceHogs on Friday evening at 7:00 PM CST. Unless they disallowed that last goal, it was a 5-4 loss.